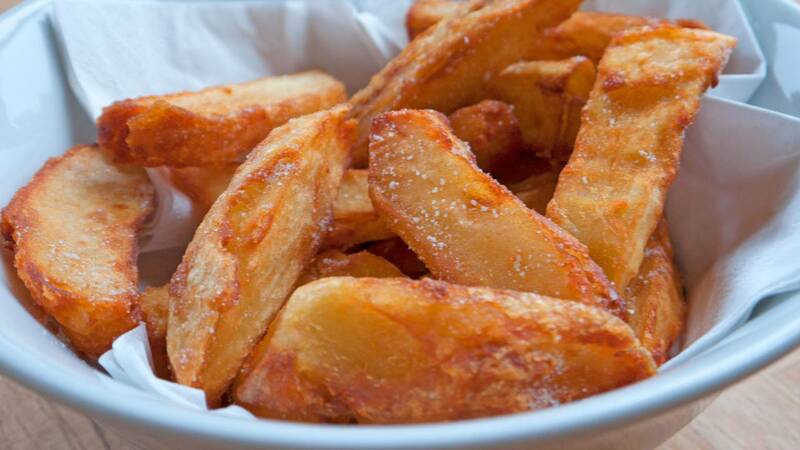 Video Recipe - Everybody loves french fries, and I'm certainly no exception. This is probably one of the recipes I have spent the most time on perfecting through my cooking career. I have tried out in double- and triple-fried. Blanching at 84°C (183°F) for one hour followed by deep-frying at a relatively low temperature, cooling and refrying at a high temperature etc., Etc. In short, I have tried all the methods I've read about. Along the way I learned a lot about what is important for good fries and what is not. The four necessary main points I have written into my "kvalifood law of fries" which is in the notes of this recipe. but most importantly, I have developed a french fries recipe that suits my taste 100% and works every time. Yielding the best and most crisp fries at all possible. Bake the potatoes for one hour in a 200°C (390°F) oven. If they are not that big you can get away with 45-50 minutes. But they should be well done. When they have cooled a bit, put them in the fridge until they are to be fried. Peel them. It is not absolutely necessary, but you should at least remove the loose skin. Heat up your fat to 170°C (340°F). Cut them on the thin side. Once you have done that you will typically see that the potato is cracked down the middle on the other side. Split the potato where it is cracked so that it eventually ends up as 4 quarts. Cut each quart roughly down the middle. Each potato therefore will be 8 wedges. Fry the wedges in as large portions as your fryer can cope with without the oil dips below 150°C (300°F) for an extended period during frying. Each batch takes about 10 minutes for me in my deep fryer, and I can fry the equivalent of about 3 large potatoes at a time. Place on grease absorbent paper and salt well. If you break just one of the paragraphs the penalty will be greasy, dull and sloppy fries that quickly stops being crunchy. §1 - you have to use potatoes with high starch content and low water content. They are typically called "baking potatoes" or "mashing potatoes" in stores. §2 - you have to bake or boil the potatoes until tender before frying. §3 - the potatoes must to be cooled in the refrigerator for at least 8 hours before they fry. All right. Sometimes I managed to get away with 4 hours. But then you have to be lucky with the sort of potatoes. §4 - they must *always* be deep fried in fat with the right temperature. Often, it is 180°C (360°F), but for these thick homemade french fries, it is 170°C (340°F). You must never make french fries in the oven. Even if you buy something called "baking potatoes" at a store you can not be sure that they actually have a high starch content. Sometimes it's just big potatoes, with a low/medium starch content, that has been titled baking potatoes. This is wrong. You should at least check that the variety of baking potatoes and the variety they sell as regular eating potatoes are different. 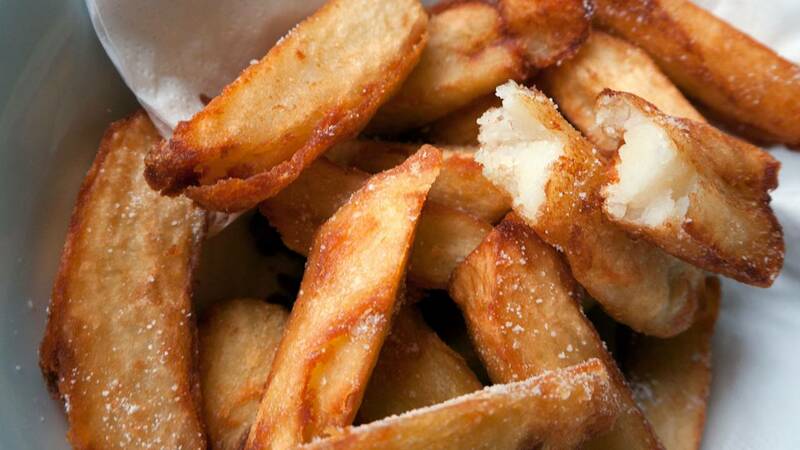 Baking Potatoes tend to crack, absorb water and swell when they are cooked. This is simply a result of potatoes with a high starch content. The slower you heat them up, the smaller the problem is. But they will never be very suitable for boiling. So I bake my potatoes. This has the advantage of cooking them, which, together with the subsequent cooling changes the starch in the potatoes. This is necessary for them to become creamy on the inside, and at the same time get a crisp brown crust. But it also makes a lot of water evaporate from the potatoes. Which helps to keep them crisp for a long time after frying. They simply don't get wet from the inside once they are fried. It has become customary to fry french fries in tasteless oils like corn, canola, sunflower and so on. This is a shame. Animal Fat tastes much better and gives more crispy french fries. Use lard or tallow. Personally I always use lard because it is the only animal fat that is available to buy in Danish stores. Animal fat also tolerates heat better than vegetable fats. Which is one of the reasons it is healthier. It's a good idea to buy a fat thermometer, or to use a meat thermometer to check the temperature of the fat. A deep fryer is not necessary. The best thing about those it is that you have a basket that fits and a place to store the fat in between frying. And less risk of starting a grease fire. If you use a regular pot for deep-frying, you MUST use a thermometer before frying each batch. If the temperature drops below 150°C (300°F) during cooking you need to make smaller portions. I prefer the thick and rustic fries in this recipe rather than the smaller versions. The kvalifood law of french fries still applies quite unchanged for the thinner fries. You just have to do some things a little differently. The main change will be to peel the potatoes first and then cut them into ½ to 1 inch strips. These must then be boiled until tender and then cooled down. I bake my whole potatoes, as opposed to peeling and boiling them in the final French fries form. Baking Potatoes are large and you can fit many more into the oven than in a pot. There is only one advantage of cooking the potatoes cut into their final shape compared to as whole potatoes. Namely, that you can add a tablespoon of salt per liter of cooking water and get potatoes that are evenly salted all the way through. However, there is a major problem with cooking baking potatoes. They are easily broken down in the water, and they break easily when they are cooked and hot. However, it may help to put a tablespoon of vinegar into the cooking water. It makes the surface more solid so they don't break that easy. Slow heating of the pot, and followed by a low simmering of the cooking water is also necessary. In addition, they should be in a single layer as they cool. So you quickly run out of refrigerator shelves. It is easier to bake and cool them whole and then make wedges of them when you have to cook fry them. The irregular surface you get that way also provides a larger surface area and therefore a crispier crust. When you cook them whole, we can not cut them into the thinner fries. They will crack.